I do not like this new look. You should seriously release these as themes, i would pay money for these, they look stunning! Especially the first one. The only thing i would change about it is the order of the 'Shuffle', 'Repeat' and scoring/rating system to the one we have on v2(from left to right: Repeat - Score/Rating - Shuffle). Thanks for the feedback. I'm glad you like the mock-up. I'm actually thinking about making a theme for these, but first I have to figure out how much work it will be and also have a look at the documentation and the sample skin. Also, if I decide to do it I will probably wait until the final release since I don't wanna have to fix stuff all the time when things change or break in this early stage. I just started using the beta today and the first thing I did not like was how the song title, album and artist (and the 3-dot-button) are displayed in those solid black boxes on top of the cover. Displaying the title info below the cover would definitely be the best option in my opinion. Additionally I think it might be also a good option if the transparency % for the title info boxes could be changed. I can imagine that the boxes might not be that annoying if they are like 50% transparent. What I would also change is that the artist should be displayed in front of the album title. But again, the best way would be if this was configurable, so everybody could configure it they way they prefer. It would be nice to fix this soon, you can see 44 pecent of the people would like to see it changed. I even thought about going to a different player, but will stay with this one for few more weeks. But if not changed soon I'm moving on. User selectable. Overlay on off below on off. As it stands the black boxes with white text is kind of ugly and although functional I'd rather just turn them off and see the album covers without the text. If the text could be configured like certain tv subtitles apreaance setting that would be a good option too. I think txt size color transparency and background transpancy would be best and the option to just turn it off would be the best option. Overall I like the new interface tweeks. In my opinion I really dislike a lot how it looks actually, I mean, it looks so messy and not attractive that the information is where the cover art is. Maybe you could use a part of the seekbar space to put the information in. I also think that the seekbar should be optional, I just want a normal bar that doesn't need a lot of space and that's all. Is any of them available now for free? Or even available? Where do I look? I searched through Play Store and found that none were free, or they didn't address the issue in the first place. Or you know what? Maybe I just want Max to say "I am not going to fix this" because at this point I just want to be able to give up and call it a day. Needless to say I don't think we should close the topic. You just hit a nerve, I'm sorry. I just want to know whether this will be fixed already! I wouldn't have bought this app if I had known communication would be non-existent. Max is not the only person in the world of software that has done this, it's a real issue and it's never going to be addressed, I'm guessing. It's like I'm waiting to be rewarded for my patience except I actually paid to wait and that is not a reward. I'm actually being punished for paying. It isn't even about the cover anymore, I just want a response. Please read my post, top to bottom, if you want to talk to me because I am absolutely dissapointed right now and have no patience left to explain myself anymore. I guess maybe I do have a little patience left. I did ask about where the skins were, I'm sorry. You did nothing for me to answer that way. Now, about the silence… Did Max ever say whether he would fix this or did he just hint towards it with the sample skin he released? Because that's a real subtle way of avoiding the issue. Even with the skins the titles are still not attractive at all, I guess those black squares should be deleted or maybe got them into adaptable coloros (of the album art). I think it would be cool if there was an option for the text over the album to fade after about 3 seconds, and re-appear if the album art is tapped, and when the song changes. That'd be great. I really miss the old Hide Panels option, and in the new interface it would be even better if that option became "Always Show | Always Hide | Display on Tap/Change" and it would hide all of the extraneous items that currently obscure much of the artwork area. 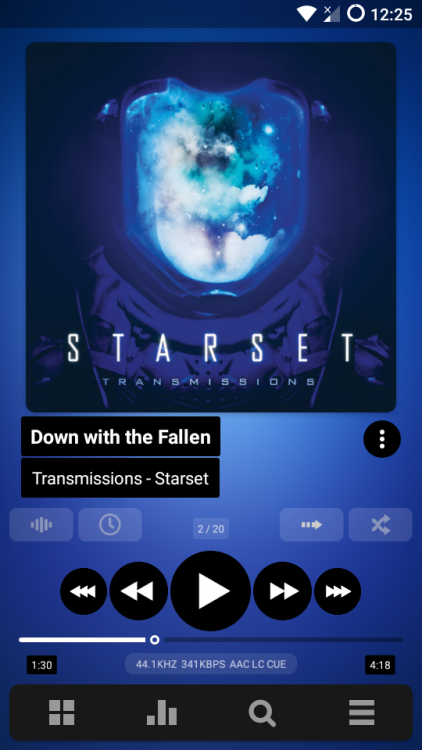 I also agree that simply touching the album art area should not take you from the Player Screen to the Library as it does now,. A Long-Press or double-tap would be a much less intrusive way to do that. Yes, I agree some options for hiding some of the UI would be great too. Another idea would be tapping the track number to take you to the list, it would make sense and tapping it currently has no function. The only possible problem is the small size. Regardless, implementing some different touch options regarding the main player screen would probably make a lot of us happy. I would move all of them (incl. like, 3-dot menu, etc.) below the equalizer, shuffle, etc. buttons. Reduce the height of the track progress zone. Reducing track progress zone would be a great idea. Maybe by 50%? The letters should be without the black box so that you can see the good cover. And you can not see the full title in some songs that have the long name, the letters should be smaller or they should scroll to show the full title. I agree. That's what it should.